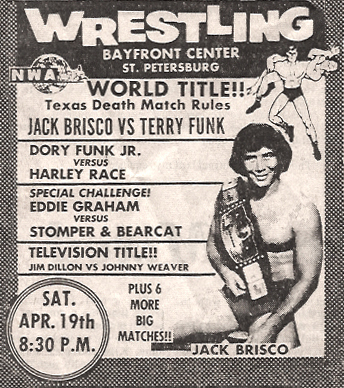 This is a great looking ad from "Championship Wrestling from Florida" featuring NWA Champion Jack Brisco and "the ten pounds of gold." What a loaded 10-match card! Not only was Jack defending the title against Terry Funk, but two former world champs were also meeting in the semi-final as Terry's brother Dory Funk, Jr. met Harley Race. Plus Eddie Graham, Jim ("J.J.") Dillon, Johnny Weaver, and others. The card was held at the beautiful Bayfront Center in St. Petersburg, Florida on April 19, 1975. The Bayfront, for my money, was one of the most beautiful arenas in wrestling, sitting by the water, it is just about as perfect a setting of any venue in Florida. We love the old newspaper ads and this one features all the components of a perfect promo ad: a cool looking marquee header, the old traditional NWA logo, old-school wrestler-artwork, great photo of the champ and his belt, all in a well designed package. Belltime 8:30!! This ad was first featured on our sister-website, The Domed Globe. This article previously posted on the Mid-Atlantic Gateway.